Silicon carbide bench stone has 2 distinct cutting surfaces: one side is coarse, the other side is fine. Fast cutting for general sharpening of cutting tools. Dark gray in color. Stone measures 6"L x 2"W x 1"H.
All Crystolon Stones are made of silicon carbide electric furnace abrasive. Electric furnace stones are made by ball-milling the abrasive to the correct particle size, then batch-blending with carefully selected bonding agents to produce the precise characteristics desired in the finishing stone. The fast-cutting abrasive is harder than any natural abrasive except diamond and does an outstanding job where moderate tolerances are desired. The resulting tool edge lacks durability as compared to India. Crystolon is the choice when speed of sharpening is more important than fineness of the cutting edge. 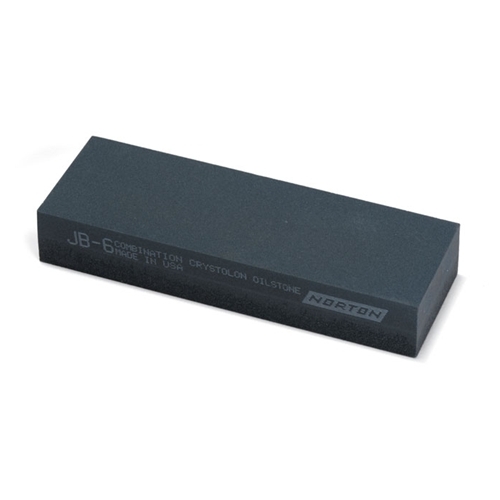 Ideal for carbide-heavy tool steel, such as M2 or the CPMs.